Back at Mulberry for their Valentine’s Day menu had me jitter with delight! It’s always a gastronomical journey at Mulberry Restaurant and Bar with Chef Rajesh and the Mulberry team. While the bows have been wrapped up, gorgeous red lanterns are replaced to bring in the festive season. No stranger here, check out my previous post on Mulberry here and here. 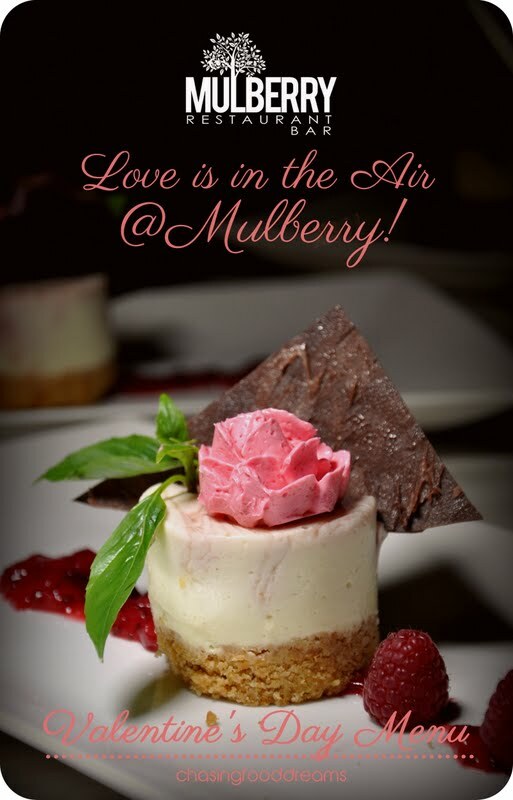 If you are looking for somewhere to court a special one or simply to wine and dine a loved one, you may want to check out Mulberry’s Valentine’s Day Menu. Much lovingness has been put into the menu to ignite all the senses and passion for this special day. 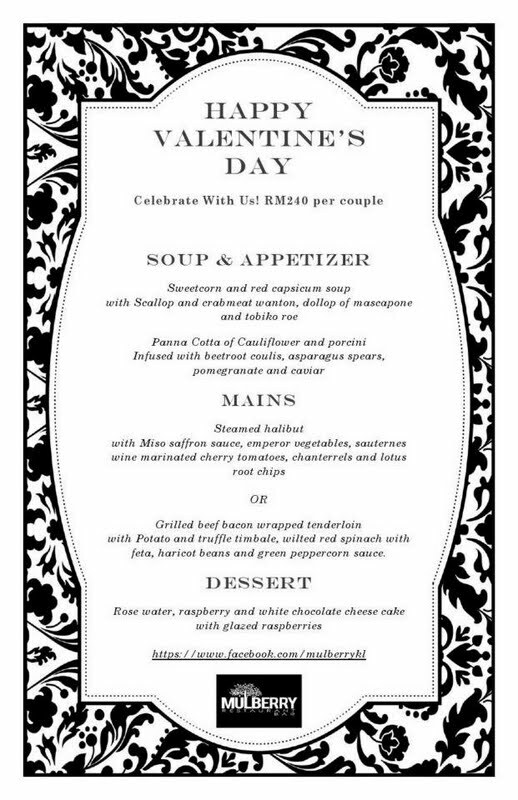 At RM240 per couple, one gets a soup, appetizer, a choice of main course and dessert each! I have always enjoyed the soups here tremendously. This one also joins the beautiful list for its creamy and velvety essence of corn in the bisque. A side of colors in the form of corn and capsicum relish evoked sweet and tangy flavors while the fusion of wantan filled with chopped scallop and crab meat delighted the taste bud. What surprised me was the dollop of mascarpone cheese that made the bisque even more sumptuous in flavors! A sight to behold, it certainly looked like the Garden of Eden! With intention to create the love effect, a silky timbale of baked cream panna cotta made from cauliflower and porcini mushrooms was chilled and savory. Crowned with smoky salty caviar, the contrast of the chilled cream and caviar is truly unique and may hit either note with diners. Surrounding the main star is cubed beetroot coulis, crisp asparagus spears and tiny dollops of cream. It’s a garden of flavors here while the presentation is set to win the hearts of many! A choice of mains with fish or beef, it’s not that hard of a decision to make. Simply order one each and you get to feed each other… wink! I chose the fish and was really pleased with the dish. A thick cut of well cooked fish are served with sauté emperor vegetables, sauternes wine marinated cherry tomatoes, chanterelles mushrooms and crispy lotus root chip. The dish portrayed clean and delicate flavors allowing the fish to shine while the nutty and creamy miso saffron sauce was delicious. It’s a pairing made in heaven! 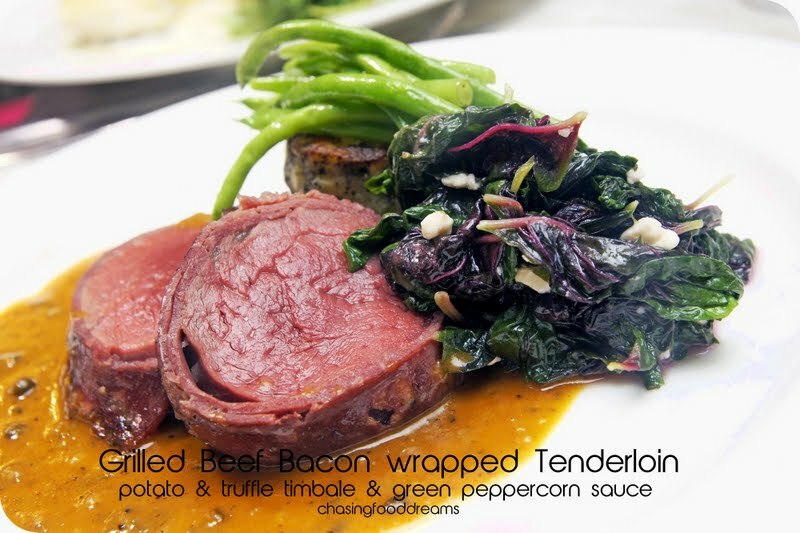 A masculine touch, beef tenderloin is snugly wrapped with a blanket of bacon. The beef was tender and goes really well with the green peppercorn sauce. I spied potato and truffle timbale and had a taste. It was scrumptious! The perfumed potato had a rustic texture with loads of creaminess. Wilted red spinach with bits of feta cheese and haricot beans provided the much needed greens to balance the beef. Though love doesn’t end here, it was sweetened with a romantic dessert in the form of a rose water, raspberry and white chocolate cheesecake. One can sense the presence of the rose at sight and in aroma in the dessert. Rich and silky smooth, the cheesecake was meant be loved by diners! Wines are not included in the Valentine’s Day Menu but one would certainly want some to wine and dine their loved one! Are you in love with this menu yet? Gong Xi Fa Cai & Happy Valentine's Day!